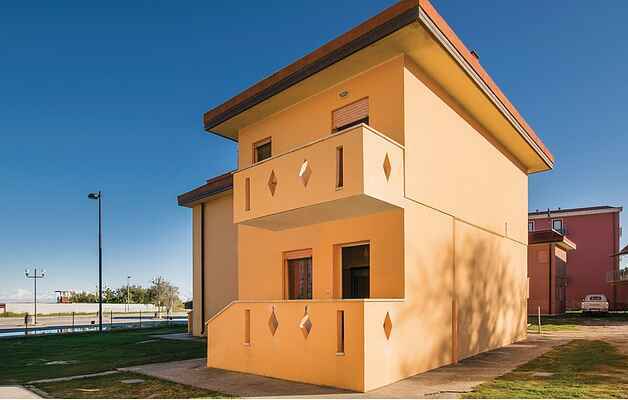 This nice first floor apartment, which is accessed by an external staircase, is set in a residence just 150 m from the beach and from the town centre of Rosolina Mare, which is the jewel of the Parco del Delta del Po, a 8,5 km long peninsula surrounded by the waters of the valleys and the Adriatic Sea, and mostly covered by dense and lush pine forest. The fine sandy beach offers bathing establishments with all amenities including a beach for dogs (surcharge). The area has numerous recreational and commercial activities that meet the various needs of the tourists, swimming facilities, tennis courts, tourist docks, bicycle rental, shops and restaurants of all kinds. From Rosolina Mare you can reach several cities of art: Rovigo 50 Km, Venice 60 Km, Padova 50 km, Ferrara (85 km), Ravenna (95 km), Mantova (135 km), Bologna (139 km), Verona (140 km). In the same residence are the accommodations IVK493, IVK494 and IVK495. Check-in is possible only from 3.30 pm ' 7 pm.